Do you know what 'natural' beef means? If not, you may pay more for it. New research shows consumers not only misinterpret the label, they’re willing to pay significantly more for “natural” steak when they’re unfamiliar with the U.S. Department of Agriculture (USDA) definition. A petition to the USDA claims that natural labeling misleads consumers. Carola Grebitus, assistant professor of food industry management at the W. P. Carey School of Business at Arizona State University, and her co-authorsKonstantinos G. Syrengelas, Virginia Tech; Karen Lewis DeLong, University of Tennessee; and Rodolfo M. Nayga Jr., University of Arkansas. investigated this claim by conducting an online experiment using 663 beef-eating consumers. The researchers tested their willingness to pay for steak labeled with different attributes — natural, grass-fed or corn-fed, fed without genetically modified feed, produced without growth hormones, and no antibiotics. Half of the participants were provided with the definition of natural, while half were not. The USDA defines natural as: "A product containing no artificial ingredient or added color and is only minimally processed. Minimal processing means that the product was processed in a manner that does not fundamentally alter the product. The label must include a statement explaining the meaning of the term natural (such as 'no artificial ingredients; minimally processed')." “Our results indicate that consumers who are unfamiliar with the definition of natural overestimate the positive effects of natural production and therefore are willing to pay a premium for natural-labeled beef,” said Grebitus. The study, "Is the Natural Label Misleading? Examining Consumer Preferences for Natural Beef," was recently published in Applied Economic Perspectives and Policy. To read the full research paper, click here. Beef consumers who are uninformed and unfamiliar with the USDA definition of natural are willing to pay $1.26 more per pound for the standalone natural label. And they’re willing to pay even more when combined with other positively perceived labels, as much as $2.43 more per pound for natural and no growth hormone. On the flip side, consumers who were given the USDA definition of natural were not willing to pay a premium for the natural label alone, unless the natural label appears together with other positively perceived labels. Researchers found that informed consumers will shell out $3.07 more per pound for steak labeled as natural and no growth hormones. Those who already considered themselves familiar with the natural definition also did not place a premium on natural beef but were willing to pay significantly more for the natural and grass-fed label combination — $3.80 more per pound compared with the no-label option. That group also would pay $2.93 more per pound for the natural and no-growth-hormones label mix. According to researchers, this supports the hypothesis that consumers who are familiar with the natural definition do not value it as a standalone label, but have a higher willingness to pay for a product that carries this label in combination with other positively perceived labels. The findings indicate that policies or initiatives that would educate consumers more about the meaning of the “natural” label are needed. Researchers say this is an important and urgent issue not just for meat, but also for food products in general. “Labeling food with claims that are not clearly defined can be costly for consumers and hold disadvantages for food manufacturers or producers who don’t use such claims,” said Grebitus. Several companies and consumer groups have voiced concerns that the natural label on food products is misleading and should be banned or, at the very least, redefined. Results of this research suggest that the USDA and FDA should consider revising policies overseeing natural labeling, not only making them transparent but consistent with each other, making it less confusing for customers. No. 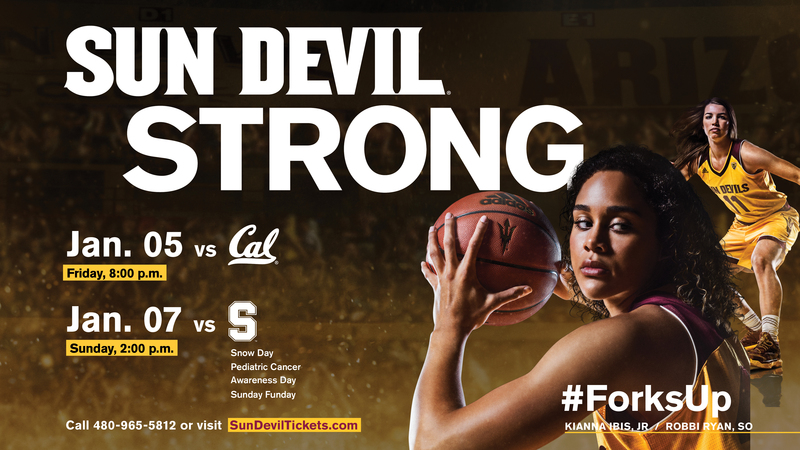 25 Sun Devil Women's Basketball kicks off the new year and their home conference matchups with a contest against No. 23 Cal at 8 p.m. Jan. 5. As a part of Sunday Funday and Snow Day, use promo code SNOW to purchase $5 discounted tickets.